A modern day who’s who of bodybuilding. The stars include: Dorian Yates, Vic “Mr. Big” Richards, Marla Duncan, Flex Wheeler, Kevin Levrone, Paul Dillett, Porter Cottrell & Lenda Murray. The 1994 FIBO in Germany was again host to 4 days of the largest bodybuilding and fitness expo the world has ever seen. A galaxy of bodybuilding and fitness stars and pro bodybuilders all come together on one posing stage. It reads like an Olympia line-up – a modern day who’s who of bodybuilding. We saw one of the greatest posedowns of all time which included DORIAN YATES, KEVIN LEVRONE, PAUL DILLETT who are pictured rear cover, plus the amazing VICTOR RICHARDS who we put on the front cover. His photos and appearances are so rare. Also the great champions FLEX WHEELER, CHRIS CORMIER, VINCE TAYLOR and a young GUNTER SCHLIERKAMP. The climax was the mass pose down of all the Weider champions at the end of the event. Mind-blowing, awesome…anything we could say would be an understatement. Another highlight was our first ever taping of the humungous “Mr. Big” Vic Richards of USA. This is extremely rare footage of the famous and elusive Mr Richards. Will we ever see him and Dorian Yates together again, preferably competing side by side at the Olympia? (It never happened). Not to be outdone was Austrian, Manfred Hoberl, 6’5”, 310lbs, 26” arms and 63” chest. He is probably the world’s largest muscular man. Denise Rutkowski was the most muscular woman at FIBO, edging out Lenda Murray for this title, contrasting with the lithe sensuality of American Fitness Queen, Marla Duncan. 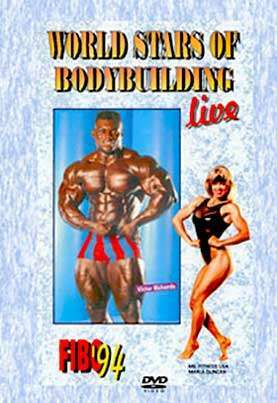 In this DVD you will see the very best that bodybuilding has to offer.